I read this article and found it very interesting, thought it might be something for you. The article is called Campaign Statement – The Freedom Foundation: every worker’s enemy and is located at https://votesocialism.com/the-freedom-foundation-every-workers-enemy/. In the debates over the causes of wage stagnation, the decline in union power has not received nearly as much attention as globalization, technological change, and the slowdown in Americans’ educational attainment. Today labor unions and other organizations fighting for working class people in the U.S. are in an ideological war with economic libertarians and social reactionaries mobilized by the Koch brothers (the second wealthiest family in the country) and their billionaire pals. In Washington State, the so-called Freedom Foundation is a key player in this rightwing, anti-union movement. The foundation’s CEO is Tom McCabe who led the Building Industry Association of Washington State for 21 years and was called the “counterbalance to labor unions” in the Northwest by the Wall Street Journal. His goal is to make Washington, Oregon and California “right-to-work” states and thereby decimate union membership. Right-to-work laws were popularized in the 1930’s to counter militant, interracial union organizing drives during the depression. Texan Vance Muse, who coined the term, was a lobbyist, political strategist and white supremacist who used racial stereotypes and slurs against Black workers to win white support. Of the 28 states with these laws on their books today, 19 states adopted them during the Jim Crow era. Advocates of these laws pretend that a single worker can win fair wages and better working conditions negotiating alone with multinational corporations than by joining forces with other workers. While union-busting is the main focus of the Freedom Foundation, it also advocates extreme property rights to the point of opposing any and all environmental protections and laws that regulate pollution and land use planning. According to their web site they are “working to reverse the stranglehold public sector unions have on our government” while vilifying teachers’ right to strike and supporting privatization of education. The foundation opposes raising the minimum wage and expanding sick leave laws. It advocates overturning sanctuary city ordinances and Seattle’s new tax on high income earners. It is also trying to block unionization drives by Uber and Lyft drivers. If all that was not enough, the foundation is also anti-abortion and invited Andy Puzder, former CEO of CKE Restaurants, the parent company of the Carl’s Jr. and Hardee’s burger chains, to address their 2017 annual meeting. Puzder was President Trump’s nominee for Labor Secretary until it was revealed his former wife had charged him with violent domestic abuse on Oprah’s TV show no less! About the same time, a news organization study brought to light the fact that Carl’s Jr. and Hardee’s ranked first among major burger chains in the rate of federal employment discrimination lawsuits per billions of dollars in sales. That didn’t stop Trump from claiming that “his extensive record fighting for workers makes him the ideal candidate to lead the Department of Labor.” Congress thought better of it and rejected him, but not the Freedom Foundation. Unfortunately, today economic libertarians like the billionaire Koch brothers are making a comeback. Now they are allied with social reactionaries who want to turn the clock back on every advance made in the last 90-plus years: women’s right to abortion, LGBTQ rights, the Voting Rights Act, Obamacare, immigration reform, Social Security, Medicare, public education, etc., etc. 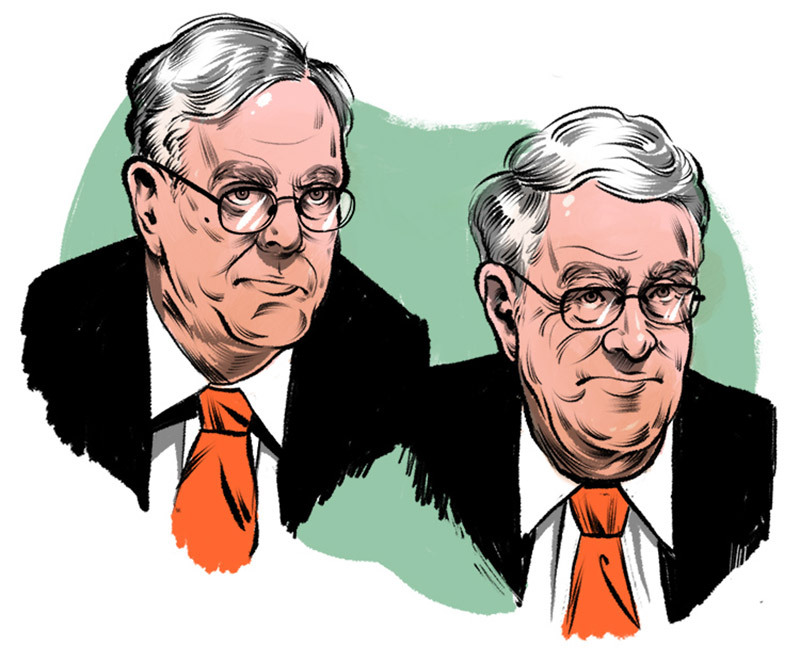 The Freedom Foundation does not get money directly from the super-rich Koch brothers, because they mask their gifts through a maze of secret, non-profit charities and “social welfare” groups which manage to evade public accounting through the use of various tax loopholes. In politics, this is called Dark Money. Normally, private foundations are required to publicly disclose their finances in order to prove that they are actually performing the public service for which they get tax exemptions. But the billionaire elite has created rightwing entities such as Donors Trust and Donors Capital to shield the rich from publicity about their political giving. What is known is that Donors Trust gave away $740 million between 1999 and 2015 without ever revealing where the money came from. Donors Trust backed the Freedom Foundation with $1,900,000. The Lynde and Harry Bradley Foundation, another rabidly anti-union group, gave $600,000 to the Freedom Foundation between 2011 and 2015. Harry Bradley was an early supporter of the rabidly racist and reactionary John Birch Society which smeared the Black civil rights movement as a Moscow front. The Bradley family foundation has raised more than $750 million since 1999 to push their far right, corporate agenda including backing a little-known county executive named Scott Walker. Walker went on to bust public worker unions as the governor of Wisconsin. The Freedom Foundation is a tentacle of what has become known as the “Kochtopus.” The Kochtopus is the network of foundations, think tanks, media outlets, so-called scholars, handpicked politicians, and phony public interest groups that work to legitimize a corporate agenda. They are working day and night to turn corporate self-interest into a movement of people on the streets. And as can be seen with the formation of the Tea Party and the rightward march of the Republican Party, they are extremely effective, especially since the Democrats themselves support a corporate agenda and find it impossible to mount a good defense of the social gains of the 20th century. These economic libertarians believe in completely unregulated capitalism. They want to turn the clock back to the early 20th century when government in the U.S. played no role in assisting the poor or regulating conditions of work. When charities and churches were the only social safety net. When there were no labor laws any employer had to respect. When massacres of workers and their families were the price paid for striking. Today this is called neo-liberalism but it is just a new name for the libertarians’ old idea that capitalism, free of any and all government regulation is the engine of economic growth and human happiness. That may be true for billionaires, but the rest of us need unions, public services, healthcare we can afford, and public education. And a large majority of Americans agree. A 2017 Gallup poll found that approval of unions had risen five points in a single year, to 61 percent, the highest since 2003.